Arhondula is an attorney-at-law at the Supreme Court and a managing partner at “Arhondula Papapanagiotou & Partners Law Firm”. 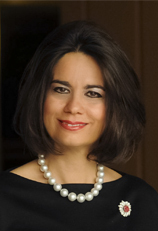 She is external legal counsel for IPR on behalf of Piraeus JEREMIE Technology Catalyst Fund. Arhondula presents continuous and active participation for more than 20 years in all sectors of intellectual and industrial property rights, such as copyright, industrial designs, patents, trademarks, software and new technologies, offering a complete range of services in all above mentioned fields. Her experience as legal counsel on behalf of anti piracy organisation for s/w protection, collective management organisations, s/w and new technologies companies, tv and radio broadcasters, theatrical production companies, sound recording companies, production companies of audiovisual works, publishing companies and of numerous greek and foreign artists has, among others, allowed her to conclude major due diligence and IP Audits for large national and international legal entities. Arhondula holds a Masters degree (LL.M) in Intellectual Property from the Queen Mary and Westfield College (QMW), University of London, and an L.L.B. Degree in Law from the National and Kapodistrian University of Athens. She is a member of the Athens Bar Association since 1986 and is a member of the HELLENIC ASSOCIATION LITTERAIRE ET ARTISTIQUE INTERNATIONALE (ALAI).